If you’ve been keeping up with my recent blog articles, you’ll know that I’ve been focusing on the topic of moving applications from MongoDB to Couchbase. 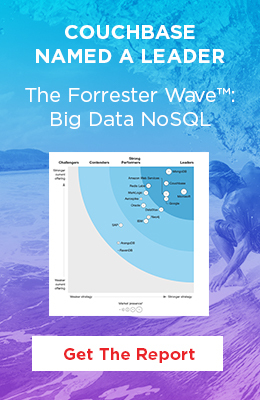 NoSQL is great in modern web applications, but not all NoSQL is created equal and at the end of the day you’re going to want something not only easy to use, but something that will scale and be reliable. This is why Couchbase is so important in modern application development. Not too long ago I wrote about migrating from MongoDB with Mongoose to Couchbase with Ottoman. The core of that tutorial was around using two different ODM tools in Node.js that shared the same APIs, making the transition almost seamless. However, what if you’re not using an ODM in MongoDB and have no interest in using one? This time around we’re going to take a look at moving a Node.js application that uses MongoDB and the MongoDB query language to Couchbase with N1QL. In short, N1QL is a technology that lets you run SQL queries against complex JSON data. This makes it not only easy to use, but very clean in the application layer. More information on N1QL can be found in the Couchbase Developer Portal. We’re going to be using the same example problem used in the previous article, but it is alright if you haven’t seen it. Everything here will be started with a clean slate. Because we will be seeing both the MongoDB and Couchbase equivalent, you should have both databases available to you. If you’re already a MongoDB developer, a lot may be familiar to you, but that is your call. Before developing the RESTful API with either technology, it is a good idea to first understand the data model that will be used. While both MongoDB and Couchbase are document databases, they are not entirely the same. MongoDB stores data as BSON while Couchbase stores data as JSON. From a modeling perspective, it won’t really matter to us. Each course will maintain a list of all the students that have been registered. In this case, the list will consist of id values that reference other documents. We’re establishing our own document relationships. Notice that the above document is similar to how we modeled our courses. Each student will maintain a list of all the courses that they are registered to. These courses are ids that reference the appropriate course document. There are a hundred different ways we can model our documents, this is just one example. For more information on data modeling, check out this documentation. Now that we have a model for our documents, we can focus on building an API with each technology. While you might have your own MongoDB application code, we’re going to create one from scratch so the migration remains very easy to understand. The above commands will create a new package.json file in your current working directory and install the necessary framework and database dependencies. All interaction with the database will be done from each of the models and all API routing and interaction with the client will be done from the routes files. Bootstrapping the application and connecting to the database will be done from the app.js file. There is a lot happening in the above database model. We need to break it down to make it easy to understand. The more we understand, the easier the migration process to Couchbase will be. Now what if we want to update a document that already exists? In particular, what if we want to add a student to an already existing course? The above code will use the updateOne method to lookup a particular document by id and replace the students array with a new one that we provide via the updateStudents function. Nothing too difficult so far and no real stress added to the developer. To make this possible, the array must first be flattened via an $unwind and joined via a $lookup operation. It doesn’t stop there because we want our results to be formatted in the same fashion, only replacing the ids for objects. Because of this we have to do further flattening, grouping, and manipulations. A full explanation of joining data in MongoDB versus joining data in Couchbase can be seen in a thorough article I wrote previously on the subject. Long story short, the more complicated your data, the more complicated your aggregation query will be. For a flexible data model, this becomes not very flexible for an application developer. Pretty much the same rules apply to the above model versus the model we saw representing course data. This is because the two document models were very similar to begin with. Flat for the most part with an array of id values. This brings us to the API endpoints that make use of these database methods. This is the easy part, and actually the most consistent between the two database technologies because it isn’t database dependent. In the above code we have three API routes. From an external client we’ll be able to list all courses, find a particular course, or save a new course. Depending on which endpoint is hit, the appropriate database model function will run. Not much heavy lifting is done in the routes, which based on their name, are only meant for routing. Like with the other route, there is a lot going on, but most of that is near identical. Where are differences are falls in the /student/course endpoint that is responsible for adding courses to a student and students to a course. When hitting this endpoint we first get the student and course information based on the passed id value. They both need to exist, otherwise we’ll throw an error. If they both exist, we’ll push the student id into the students array for the course document and the course id into the courses array of the student document. Then we’ll call our update method and return a result to the end user. The API is ready to go at this point. We just need to bootstrap the Node.js application and connect to the database. This is the easy part. In the above code we are importing each of the dependencies that we downloaded and initializing Express Framework. Before we start serving the API, we need to establish a connection to MongoDB. Once the connection is established, the routes are connected and the application starts serving. At this point the RESTful API can be reached at http://localhost:3000 and tested with popular tools like Postman or Fiddler. So we have an example to work with when it comes to MongoDB and Node.js. That example used MongoDB’s very own query language when communicating with the database. Now we’re going to take that application and move it to Couchbase. We’re doing this because not only does Couchbase scale better and have better performance, the query language is far simpler and easier to maintain within an application. The above commands should look familiar. We’re creating a package.json file and installing our dependencies, but instead of MongoDB we’re using Couchbase. The same logic as seen previously will end up in each of these files. The difference being the syntax for Couchbase. Starting with the same order, we’re going to create our database model functions. As mentioned earlier, we’re going to be using N1QL which is an extreme highlight of Couchbase because it allows you to write SQL queries. These queries are executed on the database and not within your Node.js application. In the above code we have the same set of database related functions that we saw in the MongoDB example. Inside each of these functions are N1QL queries. Not just N1QL queries, but parameterized N1QL queries to help fight off SQL injection attacks. This time around we have a simple query that includes a subquery. Should our data needs become more complex, the query can be altered without gaining significant size or complexity. Look familiar? The two database models are similar because the two document models are similar. Again, should the complexity change, the application layer will still be easy to manage with N1QL queries. Because the API routes don’t have any dependencies on the database, the code between the MongoDB application and the Couchbase application can be shared. To be clear, I’m referring to the files found in the routes directory. With the endpoints in place and the database models communicating to Couchbase through N1QL, we can finish off the application. In the above code we are importing the dependencies that we had installed and initializing Express Framework. Then we are establishing a connection to the database, bringing our routes together, and starting the Node.js server. At this point you should be able to access your application in the same fashion as MongoDB. Visit http://localhost:3000 from your web browser or with a tool like Postman or Fiddler. You just saw how to take a Node.js application that uses MongoDB and the MongoDB Query Language and convert it to Couchbase with N1QL instead. This is an alternative to the Mongoose to Ottoman ODM solution that I wrote about previously. So why would you want to switch from MongoDB to Couchbase? Well Couchbase is a lot faster and easier to scale, but N1QL is also incredibly simple when working with complex data. You’ll be able to reduce your code drastically and keep it more maintainable. Check out the previous tutorial I wrote about in terms of joining data between the two databases. For more information on how to use Couchbase in a Node.js application, check out the Couchbase Developer Portal.